What a joyous coincidence this year! March 21st being Japan National Holiday, and a day of exact HOLI celebrations. 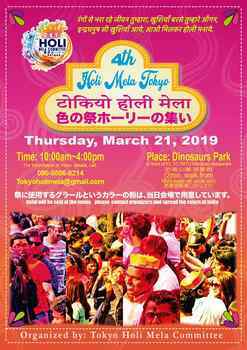 Tokyo Holi Committee invites all of you to celebrate HOLI with splash of dry GULAL, loads of music & dance, foods & drinks and will welcome the spring season. Looking forward to making this year event together with more fun with colors! !